This page is written by the game's inventor, Travis Z.
Xiangqi vs Orthodox Chess is a game designed to merge the two most played versions of chess together in an effort to allow both to come together. There is no way to copy moves made by another players as the pieces are all different and the armies have different abilities. There are two armies and hence two different sets of pieces. Each side the Xiangqi side and the Orthodox Chess side use their standard pieces and all of the pieces function the exact same way as their standard counter part unless noted otherwise in this document. Rule #1: Xiangqi wins by either performing a stalemate or a checkmate. (This is inline with standard Xiangqi rules) Orthodox Chess wins by checkmate only. Rule #2: The Orthodox Chess King cannot be seen by the Xiangqi Emperor. Hence a piece must always exist between the Orthodox Chess King and the Xiangqi King. (This is the same rule as in standard Xiangqi about two Kings not being allowed to see one another. Rule #4: If the Orthodox Chess player makes his pawn to the back row of the Xiangqi player then the Orthodox Chess player may promote the pawn to any Orthodox Chess piece or Xiangqi Chess piece. Rule #5: Crossing the River in the center (Represented by the two dotted lines) is dealt with as follows. Bishops must stay on their respected color. So if a bishop is on a blue space, it must move to another blue space. It cannot switch colors. Pieces moving straight may move into either square. From the Orthodox Chess side this means that a piece in the center black square can move straight ahead into the black or blue space directly across from it. From the Xiangqi Chess side, only the piece in the exact center black square can move into either space directly in front of it across the river. Rule #6: Any other rules not listed here should be assumed to be that of one of the standard rules existing in either Xiangqi or Orthodox Chess. This variant was always a thought I had growing up. The biggest problem has been merging the two exact boards together. Initially it would seem that Xiangqi is at a disadvantage, but with the Cannons, the Xiangqi player should be able to make quick first strikes and should be able to tie the Orthodox player up espically since the Xiangqi player can develop its pieces faster as the pieces are somewhat already in position. seonoo, you have miscalculated. the Chess (FIDE) army contains only one Queen, so (5+3+3)+8+9=39. However, Advisors cross (and block) paths so often they are hardly worth anything more than Elephants, and Jocly's Shako rates Cannons at 4.9. Splitting the difference for Cannons (I they are weaker on 8.5x8.5 board, ((0.75x5)+(1x2)+(1x2)+(2x2)+(4.4x2)+(5x2))-1.5 for King weakness=29.05, but I don't know what the 3.75 is for. The Mao is worth two pawns, the Elephant worth about one ( remember, Alfil is one and a half, and the elephant can' t cross the river and can't jump, so), the Guards maybe one and a quarter ( the ferz is one and a half, and the Guard is confined), the Cannon worth maybe four, and each pawn probably a quarter. So (2+1+1.25+4+5)x2+(0.75x5)=26.5+3.75= 30.25. But (5+3+3+9)x2+8=48!! So Xiangqi loses easily. Maybe yang qi against chess? The thing about Xiangqi vs Orthodox Chess is that the former has weak pieces defending a weak royal piece that is confined to a small area, and the latter has strong pieces defending a stronger royal piece that can move around the whole board. Aside from the quick checkmate for Xiangqi, this would be an easy win for the Chess side. 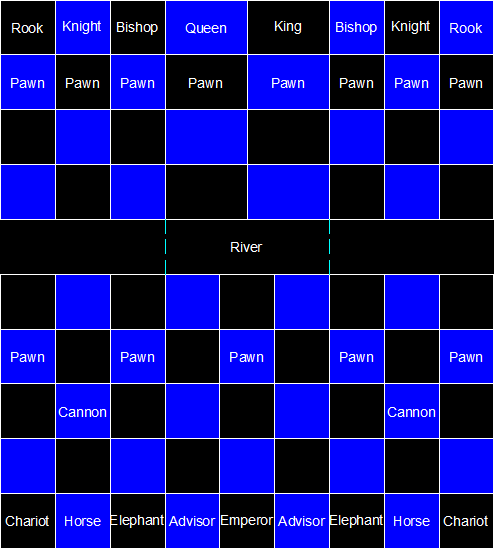 It would work better if the two sides switched royal pieces, so that one side had to checkmate or stalemate a General confined to a palace with Xiangqi pieces, and the other side had to checkmate a Chess King with Chess pieces. Even so, there are still difficulties with the game. The Advisors and Elephants are designed for defending a General that is confined to the Palace and is under attack from Xiangqi pieces. They would be less useful for defending a King that can move around the whole board, and their ability to protect the King from Chess pieces would be more feeble. There would also be the problem that Xiangqi pieces are simply weaker than Chess pieces. The side with Chess pieces would still have an easy win. Because one game uses overall weaker pieces than the other, this game is sort of like Major League vs. Little League. It's not a fair fight. Something fairer than this would be Xiangqi vs. Shatranj or Xiangqi vs. Janggi. But even in these, I suspect the Xiangqi side would be more liable to lose. The Checkmate described in previous comments is one of the reasons why I gave up my idea of a three-way variant with FIDE, Shogi, and Xiang Qi armies. Arranging the King and Queen one way would result in that Checkmate. Swapping them over would result in the XQ player capturing the Queen on their second move and the King having to capture the Cannon to stop further captures and losing the right to Castle. It would diminish the FIDE army's advantage but tend to make play stereotypical. Better, I suspect, to start with better-balanced armies to start with. Perhaps it would be better to substitute a Yang Qi army for a Xiang Qi one, with something - a Pawn, as it happens - in front of every cell of the Cannon rank. This would stop a Cannon threatening any enemy but a Pawn - all of which are famously guarded in the FIDE array anyway.